It doesn’t really matter how careful you are while riding your motorcycle, accidents can happen. 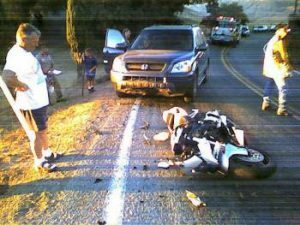 The bad thing about motorcycle crashes is that it leaves minor/severe injuries, damaged property (your motorcycle) or the ultimate price of death. That is why folks do not take the issue lightly. After a crash, individuals call 911 and an accident attorney. While you get required help, the accident attorney immediately swings into action in evaluating your case and helping you make claims according to the extent of the damage. It is recommendable that you hire the services of a veteran motorcycle accident attorney if you are to achieve a full settlement in your case. Of all the legal firms in California, we at Rawa Law Group comes out as tops and one of the most trusted legal firms when it comes to delivering best results on accident cases. At Rawa Law Group, we use everything at our disposal to advocate for the injured and we always deliver because we have at our disposal, some of the most experienced accident attorneys in California. They are well trained and we also have a combined experience of 55 years in helping accident victims get their deserved compensation. It costs nothing to hire our attorneys at Rawa Law Group because we offer free case evaluation and only receive payment after winning on your behalf. When working with you, we ensure that you have a strong presence by making you aware of every step we take. We also ensure that our appointments with you are built to fit your schedule. We offer clients a chance to meet our attorneys one-on-one and discuss how best they want to be legally represented and our trained attorneys offer legal advice to clients to help in future dealings.